So, I see it has been a while! We have been terribly busy enjoying life! Ana is doing well. Her neuropathy is very much under control with the folate treatment. We have had an uneventful year and a half, Praise God! She just celebrated her 9th birthday... and to think the doctors said she wouldn't survive birth! Wow... God truly amazes me! Ana Maria is growing like any other 9 year old with the assistance of the feeding tube... 24/7... yes, still on tube feeds. We did try to wean her off of part of that 24 hour cycle last year, but didn't get the results we hoped for. She does eat more now than she ever has, but her body doesn't break the food down at all. Confusing I know! As for the large intestine... we are back to square one with the daily enema via the malone. At least it is keeping her healthy and hospital free! Ana had been 100% seizure free since October of 2008... until this past August. She had a pretty bad seizure believed to be triggered by a fever of 100 degrees... scary! So the plan for now is to stay fever free!!! Other than that there is no real seizure plan! I think that is about it for the mitochondrial disease medical update! Now for the non-mito medical update! 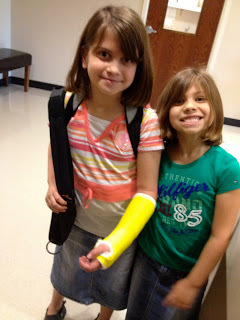 Ana broke her wrist and arm! So sad... and at her birthday party two weeks ago! She seems to be recovering well and has a follow-up with the orthopedic today. High doses of Levo-Carnitine + warm cast= ewwww.... Hoping we can address this and some raw spots on her hand today. Other than my broken foot (did this 3 days before Ana's broken arm) and Ana's arm everyone is doing great! Emily is a college student getting her Bachelors Degree in Religion, Baden is in 8th grade, Isabelle is in 6th, Ana is in 3rd, and Sage is in 1st! Where does the time go? They grow up way too fast! That is all I have for now. I will be updating about Ana's arm and my foot as we learn more. 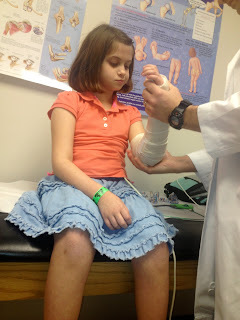 Praying she will heal like any other child and not have this cast too long. Also praying I won't need surgery to repair my lisfranc tendon. As of right now the doctors are going to repeat x-rays on my foot February 7th... I should have a clear answer then on whether or not I will need surgery. We know that I broke three bones in my foot, but with bruising and swelling the doctors can't see the tendon right now. Praying all of you are having a great 2013!